If you saw my presentation at Synergy II last February, you may recognize this as the opening slide. 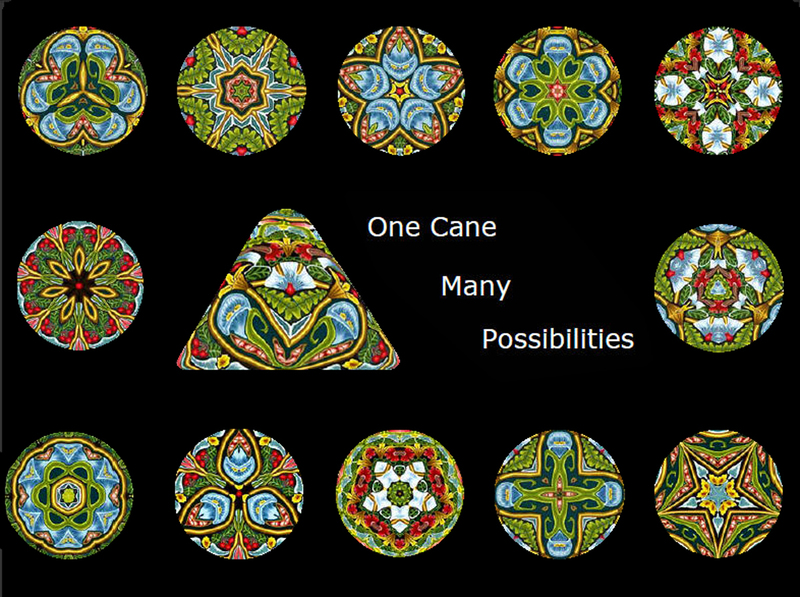 In that presentation I showed how the designs on the slide, and many more, could be constructed from a single cane. I’m thrilled to announce I’ll be teaching my method in a 6-day intensive at Maureen Carlson’s Center for Creative Arts in Prior Lake, MN, next October. The workshop will include everything I covered in the talk, from developing a personal color palette to constructing complex canes to manipulating cane slices into a one-of-a-kind kaleidoscope designs and finishing them as two-sided pendants. 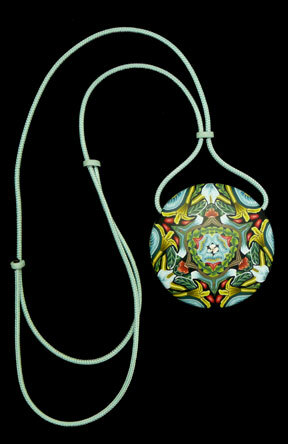 Pendant from my William Morris Inspired Cane (see the back side on my Flickr site). Maureen’s Center is the perfect venue for this workshop. There is lodging for the participants right in the Center and the workroom will be open around the clock. There will be a maximum of 7 students (one has registered already). This is how I’d always teach if I could. More information is posted on Maureen’s website. If the triangular cane looks familiar, it is probably because you saw the post about reducing this cane on Polymer Clay Daily a couple of years ago. Sometime soon I’ll be posting pictures of some of the other pendants from that cane. This entry was posted in Cane Slicer, Caning, Classes/Workshops, Color, Kaleidoscopes, Teaching, Uncategorized and tagged Carol Simmons, classes, Color, Color Mixing, color theory, Kaleidoscope Canes, Kaleidoscope Design Intensive, Maureen Carlson's Center for Creative Arts, pendants, polymer clay, Polymer Clay Classes, Polymer Clay Colorado, Polymer Clay Teachers, Polymer Clay Techniques, Polymer Clay Workshops, Workshops. Bookmark the permalink. If you’ve been reading the comments on my site, you already know about the workshop. This post is for the people who don’t read comments. OH FUN! You know I might just take this class. Not because I need the class, but just to meet you! And I love going to Maureen’s for a retreat, although it’s been to long since I have gone down there. It will all depend on my schedule. Wouldn’t that be fun! It would be great to meet you after all these years, Jenny. I’ve never been to Maureen’s but I’ve heard great things about it and, of course, Maureen is a sweetheart, so I’m really looking forward to this week. FYI, 3 of the 7 spots are taken. Sorry if this is a repeat, computer issues… I live in SW Washington state. I am a teacher. Your only Washington workshop is the week teachers return to school for trainings and prep. I’m so disappointed because I want to attend you class. I know others in my state who feel the same way. Any hope for other Washington classes? If you email me, I can give you some suggested dates from the perspective of school calendars. This is the first I’ve heard about this problem. I’m sorry, I was trying to avoid summer vacation when parents might have to be home with children. I would be happy to return and teach another workshop in your area if there is enough interest. I believe there are some people in BC who were unable to take this one, so if there are some in WA also it might actually happen. I am a member of a local (Portland, Oregon) Polymer Clay guild which is also affiliated with a larger group. Perhaps we could correspond to try and come up with some potential dates, number of students (minimum and maximum) and prices. I can take that information back to the people in this area who are working with polymer clay. We have a facebook page – Columbia Gorge Polymer Arts Network. BTW – Vancouver, WA/Portand, Oregon are beautiful in the fall! Let me know if you prefer my email address rather than boring others in this group with shop talk. Yes, email is great. Did you get the message I sent you earlier? Yes, I received your earlier email. I am about 4 hours south of Vancouver, BC. If you wanted to try and accommodate more students, then there might be possibilities halfway along the I-5 corridor which travels through Olympia and Seattle. I’m going to give you my “junk” email address to prevent anyone else from emailing me at my personal address. We can exchange more permanent contact information after you write me at kathykp47@yahoo.com. I’m looking forward to hearing more about your classes.